eBay haul time again, and one I couldn't wait to share with you as it's all makeup related bargains! If you like these kind of posts you can find my past eBay posts here and part one of this haul where I share my lifestyle-y buys for March here. 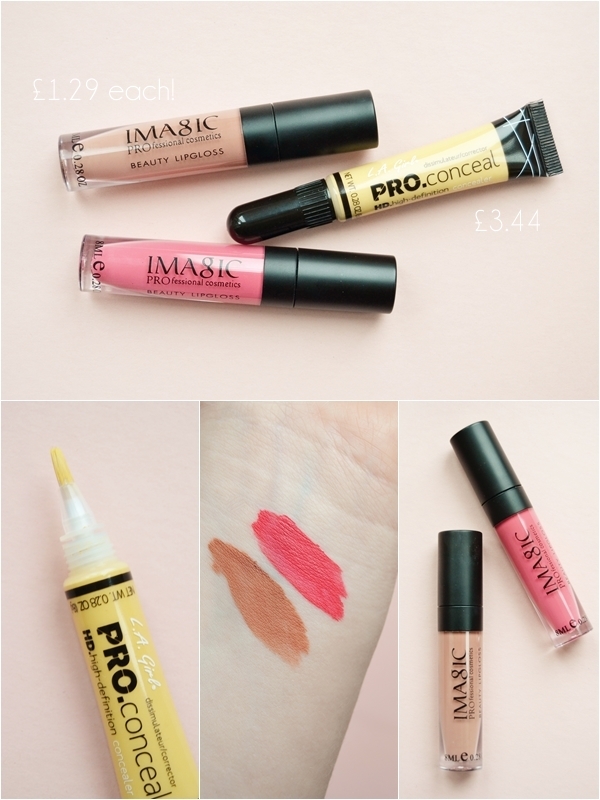 eBay is awash with matte liquid lipsticks and after trying the Menow ones (review + swatches here) I thought I'd tried some from IMAGIC as the packaging is nicer and the listing has 12 good shades to pick from! Comparing them to the Menow liquid lipsticks these are more sheer and take longer to dry/become matte, however they last just as long on the lips and really don't budge! I should also point out that if you over apply they do feel very tacky on the lips which isn't great! Having said all that I will be picking up a few more shades as shade #3 has been a favourite of mine recently and the price is pretty amazing. After picking up an L.A Girl Pro Concealer in the lightest shade last month and being really impressed with it I decided to try a corrector. I went for the yellow corrector as I haven't been able to find anything similar on the high street and I really wanted to see if it would neutralise the purple toned veins under my eyes. Much like the Porcelain shade I picked up I was pleased with the creamy yet slightly waxy formula (really long lasting!) and was pretty pleased that it does make a difference to my under eye area before applying foundation! Again I will be picking up a few more of these correctors and even trying a darker shade to contour with. On to brushes now and something I'm on the fence with! You see I like to buy 'dupe' brushes and with this listing containing no branding I presumed it would turn up like that. However it actually turned up with the Nars logo to it - naughty eBay seller! I don't overly mind but it's something to be aware of. Aside from that the brush has a lovely rubberised finish to it and is good quality. As for the bristles they are on the cheap side but feel soft and it actually lays contour down well due to the size and shape of it. 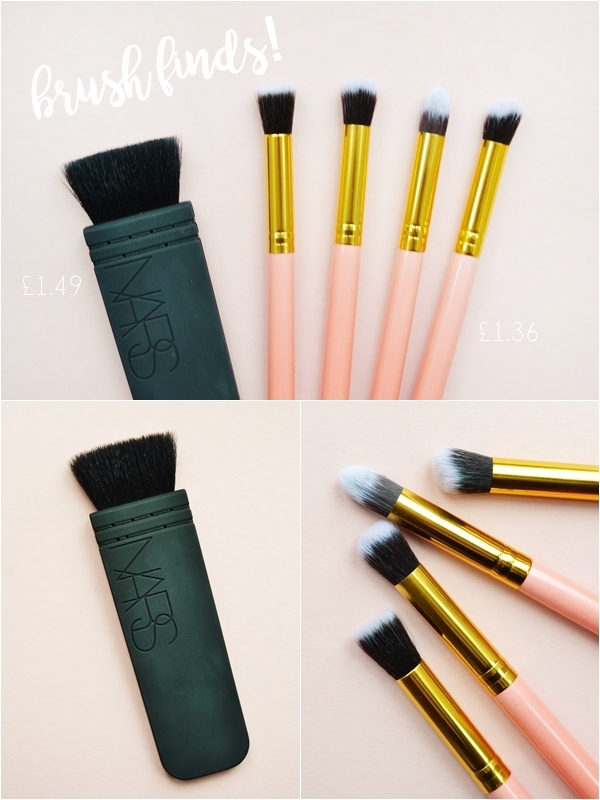 Quite a unique brush to pick up but of course be aware this is a Nars fake. This is one of my favourite brush sets from eBay, in fact I already own two sets of these - yes, they are that good! This time as I was wanting a set just for concealer and loose powder I went for the pink and gold set, so I could differentiate between my eyeshadow brush sets, and I actually really like how they look! These are well made and so soft to touch, making them ideal for blending eyeshadow with or blending out concealer. You can read about how I like to use them and for a 99p silver/black version here. Whilst browsing nail supplies I came across a type of nail decal I'd never seen before - laser cut metal foil decals. I of course instantly snapped them up as I loved the designs and the fact they are double sided, black and rose gold - just yes! In the wheel there are 12 different intricate designs that range from diamonds to sweet little cherubs and are applied to the nail by simply placing them onto a still wet clear top coat and then sealing them with another layer of top coat. I will be sure to create a nail look with these very soon! Really pleased with this bargain buy. Lastly I picked up a lovely Technic top coat that I spotted on Pinterest and as it was nothing like anything in my collection I had to find it! This is truly a perfect top coat for spring over any pastel base, here I went for Barry M Gelly Coconut which I think really compliments the pastel flecks. I already know this will be a Spring favourite of mine. Hope you've found some lovely bargains here!